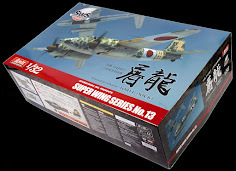 With the A-6E in 32nd scale FINALLY available from Trumpeter we have now got a choice in alternate decals with AOA decals new sheet providing seven choices in that scale for your TRAM aircraft. 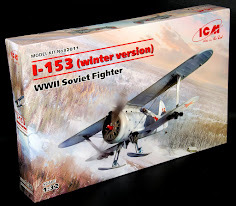 Today we take a look at the sheet and try to find the aircraft IN the periods depicted to see if both decals and research are good or bad - see what we thought about them in our in-depth review. 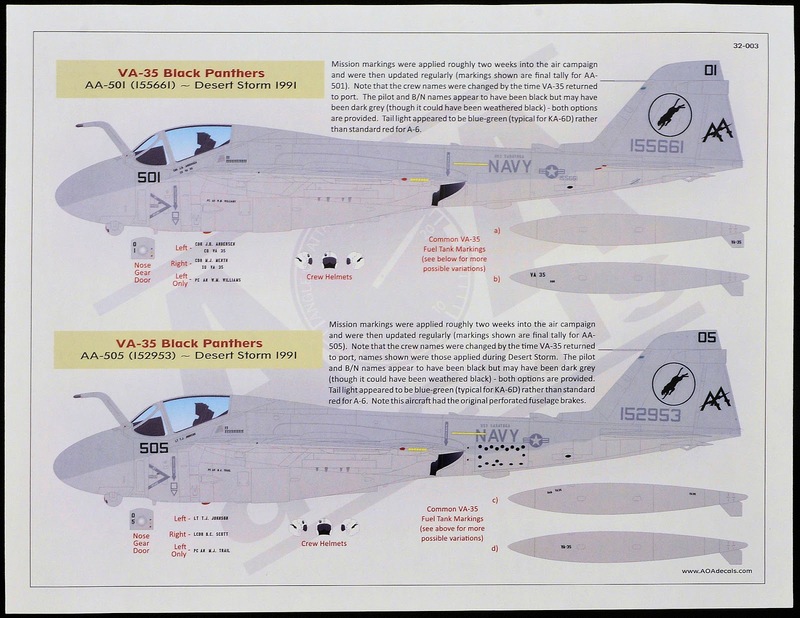 AOA decals have already released quite a few interesting decal sheets that have quite comprehensive choices and information on those schemes in decal sheets in 32nd, 48th and 72nd scales. Today we have a 32nd scale decal sheet available that features the A-6E Intruders that were made famous for their actions in both Libya and Iraq. 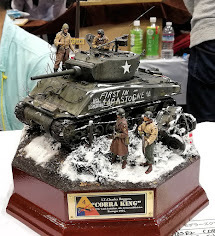 We had the chance to look at and to try out AOA decals already in our review last month of the excellent sheet “32-004 - Black Ponies & More Broncos” on TMN. We thought it was pretty darn good, and the research and total number of schemes was a credit to the makers of the decals. 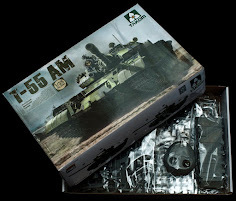 We had high hopes for the next release we saw and being a fan of the A-6 I was looking forward to seeing what was on offer here. 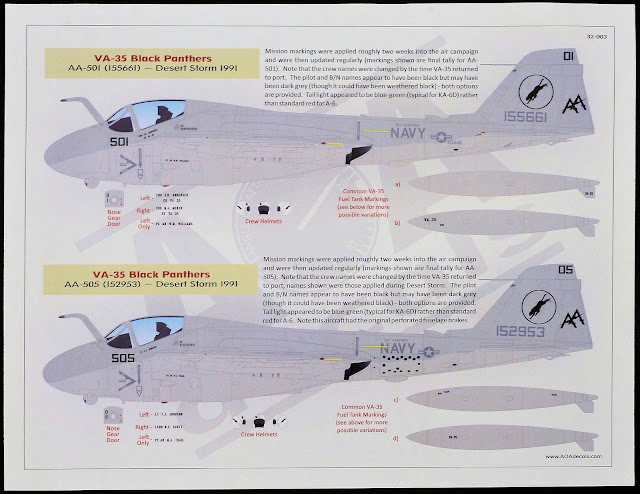 This sheet from AOA contains seven marking schemes of the 32nd scale A-6E to match the recent Trumpeter kit (finally) released this year. All of the aircraft pictured here are in the “low-viz” schemes of all over grey/black/white but if you are after the A-6 in high-viz then take a look at the earlier models in the AOA Decals sheets INTRUDERS FROM THE SEA or the INTRUDERS FROM THE BEACH set. The kites seen on this particular sheet may well have been on the news as the takes-offs were often seen on the nightly/ hourly coverage from the image hungry news so they will be popular choices I would think. Three of these aircraft became a bit of a fixture on the coverage of the strikes over Libya in reprisals for the Berlin bombings. All three squadrons from the Operation Prairie Fire (March 1986) and Operation El Dorado Canyon (April 1986) missions in Libya are represented so the interest is spread around a bit. 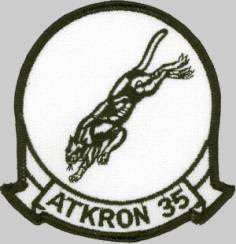 The squadrons involved were VA-34 "Blue Blasters" (from America) and VA-55 "Warhorses" (from Coral Sea). 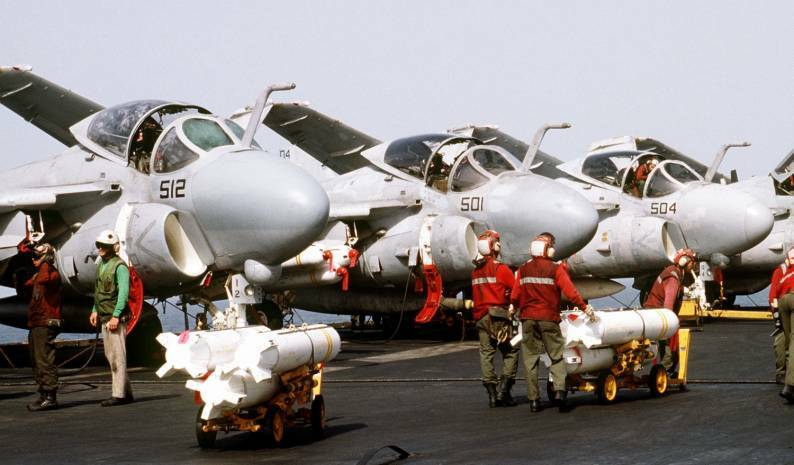 These aircraft operated from the aircraft carriers USS America, USS Saratoga and Coral Sea during the strikes. This sheet also has two aircraft each ( 4 in total) from the first Gulf war with aircraft from the two squadrons from Desert Storm from Jan. to Feb. 1991. 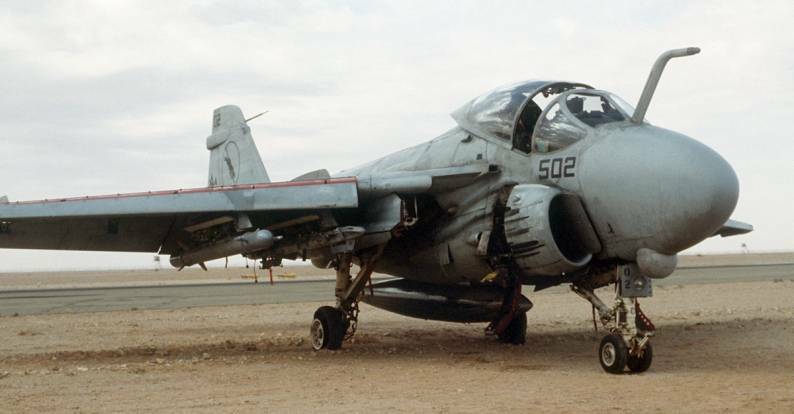 During Operation Desert Storm in 1991, U.S. Navy and U.S. Marine Corps A-6s flew more than 4,700 combat sorties, providing close air support, destroying enemy air defences, attacking Iraqi naval units, and hitting strategic targets. 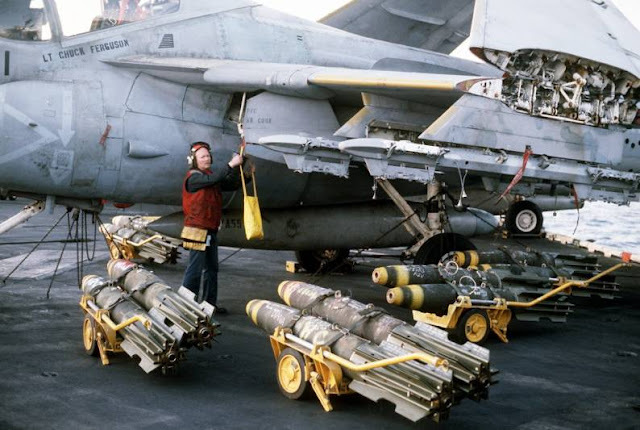 They were also the U.S. Navy's primary strike platform for delivering laser-guided bombs. 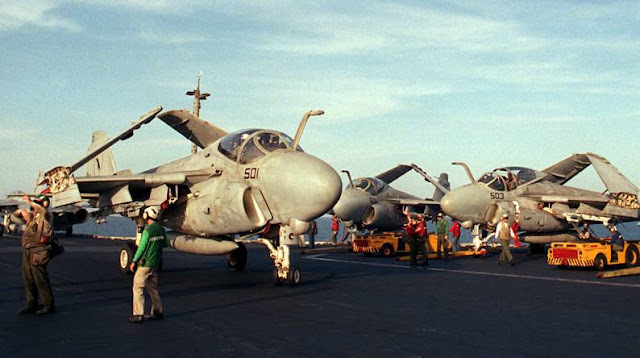 The U.S. Navy operated them from USS Saratoga, while U.S. Marine Corps A-6s operated ashore, primarily from Shaikh Isa Air Base in Bahrain. The decals come in a zip-locked plastic bag and mine came with a hard card backing - they were safe when I opened them up.. The package houses eight A4 pages on coloured printing paper and two decal sheets. The Instructions Provided : Just like the Bronco sheet from AOA we already have looked at the helpful instructions are again extensive. 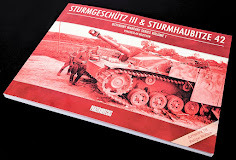 The four full colour A4 landscape sized paper pages printed on both sides with not only aircraft profiles and information but also some other details you would not expect. An introduction of the decals with the aircraft listed on the sheet with some pretty helpful advice about the camouflage included. 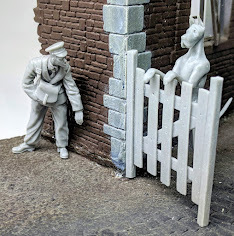 The method of patch ups and the changes of condition of the paint, it's official numbers and how it was applied make for some really interesting tips on your own model. Of note on the attributes page are several notably experienced people who operated these A-6E's and especially interesting to me was the input of the crew cheif into the research with pictures and info about "their" aircraft. Probably not a better source exists in this world. 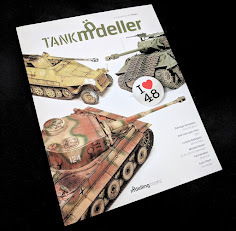 Here we see a sheet that shows you a lot about making your own TRAM A-6E from the Trumpeter kit. The cockpit adjustments needed to correctly depict this aircraft are invaluable as are the notes on the notes on the aircraft antenna and fins, the airbrake notes (perforated or not) and the interesting tip about the armoured curtains. 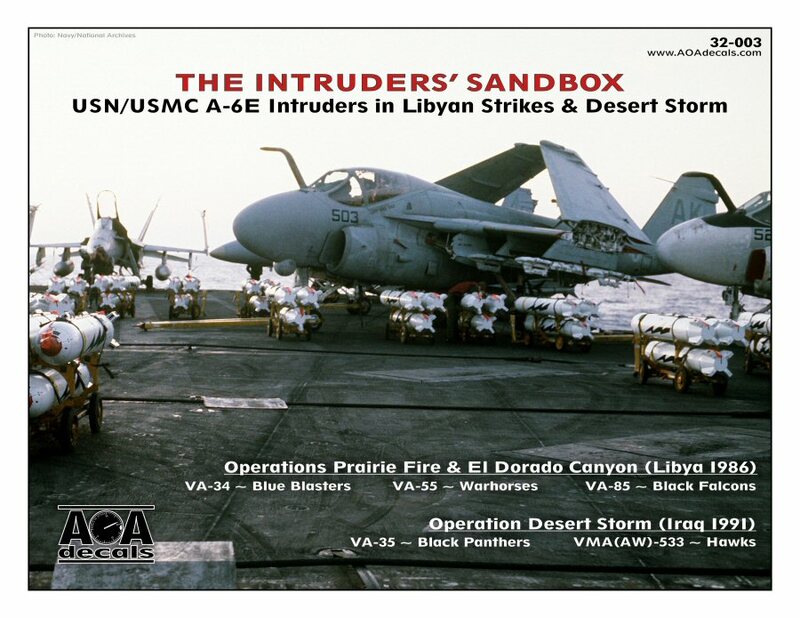 This info will no doubt stop some know it all from saying "The one problem with this is you have done ....wrong....."
Below the profiles of the Libyan strike aircraft AOA have provided the top-down view of VA-35, VA-55 and VA-85 aircraft which is a great help to modellers without the reference on hand. 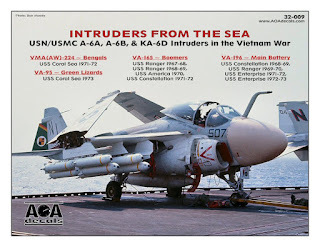 There is also an addendum to these sheets with a minor correction to the VA-34 top view. More top down views, also with details that are included on the decal sheet for the wing tips, TRAM turret & crew ladder markings as well as tip on the decals for your ejector seats. All very helpful in the search for authenticity and guided no doubt by the good help of the crew chiefs involved in these decals. 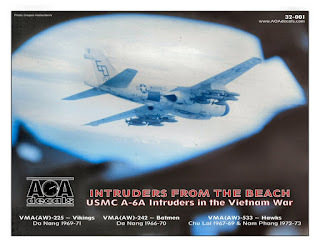 I will walk you through in a little more detail of each of these aircraft and the pictures that I have been lucky enough to have found in or around the time of the decals portrayed on this sheet. 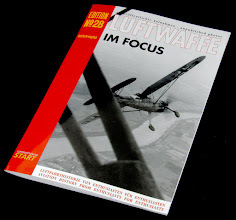 We will look at how the decals are presented and if they are like the shots we have found for the quality of research. 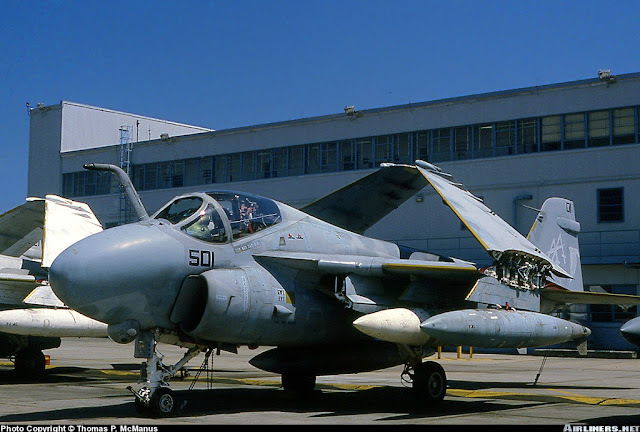 The first aircraft is No# 152948 with the option for its service in VA-34 Blue Blasters, Attack Squadron 34 (ATKRON 34) from USS America in both Operations Prairie Fire & El Dorado Canyon (1986.) Crew helmet markings are provided on the decal sheet also. A much more period photograph of this aircraft showing low-viz markings all-round. 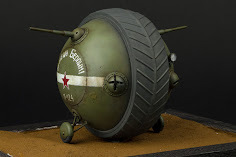 This is the cover shot aircraft you see on the front of the decal packet – you can see the nose clearly and the lightning bolt on the Mk.20 Rockeye bombs which is of course included on the decal sheet. 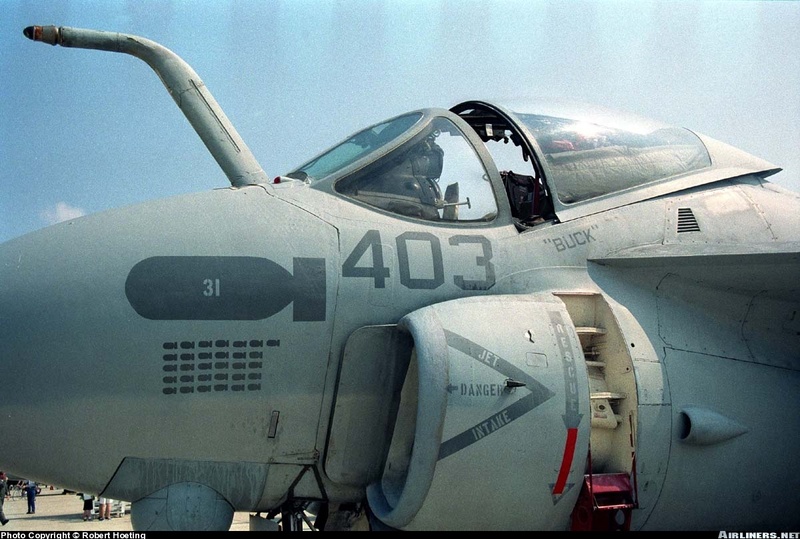 Also included are the emblems for the crew helmets and VA-55 Fuel tank stencils. 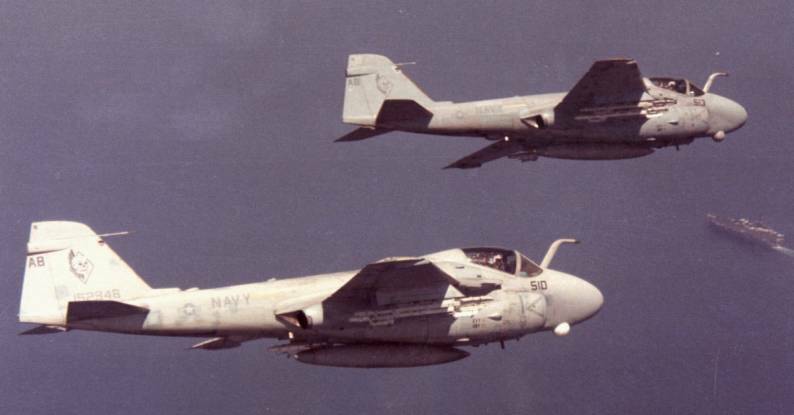 A-6E BuNo 161676 is seen here in a turn in formation. This aircraft is seen in many earlier pictures at an airbase in the UK as “500” but at the time show in these decals it is as the pictures here. Aircraft# 161685 - the option for VA-85 Black Falcons, USS Saratoga, Attack Squadron 85 (ATKRON 85) - Operations Prairie Fire & El Dorado Canyon in 1986 is also included. 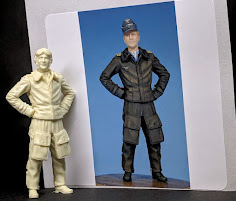 Again crew helmets are provided for on the decal sheet as well as solid grey stencils for the pilot/navigator’s names as well as details for the nose gear door and fuel tank stencils. 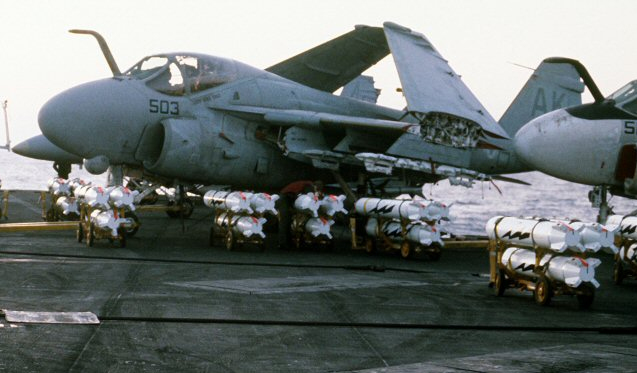 You can also see the two gunboat “kill” marks behind the canopy in this shot of the aircraft after the strikes. 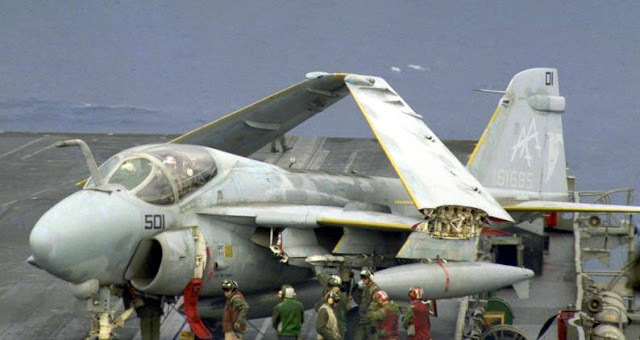 This aircraft was later lost in a practice exercise when it crashed on range during night attack. 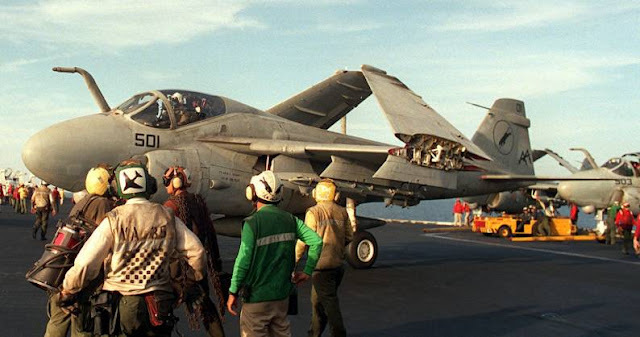 A picture of the same aircraft before the gunboat kills were added. 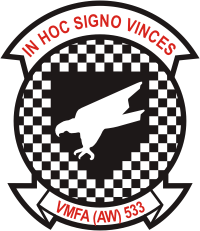 This decal sheet offers two options for VMA(AW)-533 Hawks, Sheikh Isa Air Base (Bahrain), Operation Desert Storm (1991.) 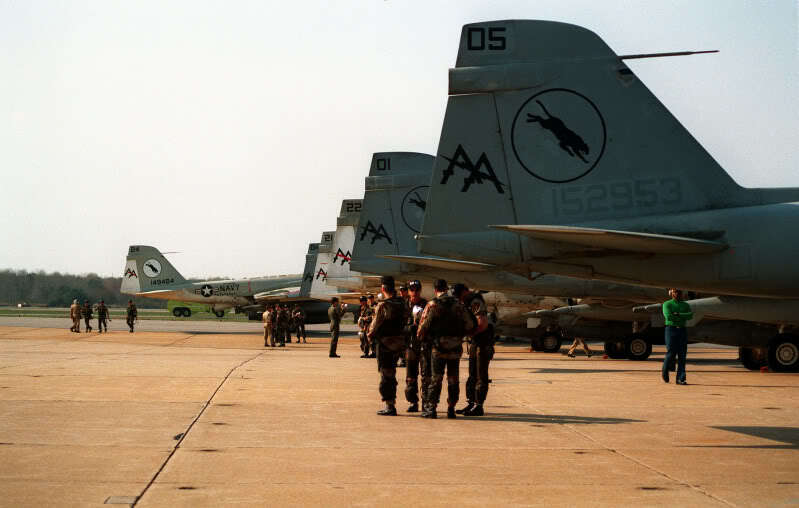 This squadron deployed to Bahrain in December 1990 for Operation Desert Shield and Operation Desert Storm. 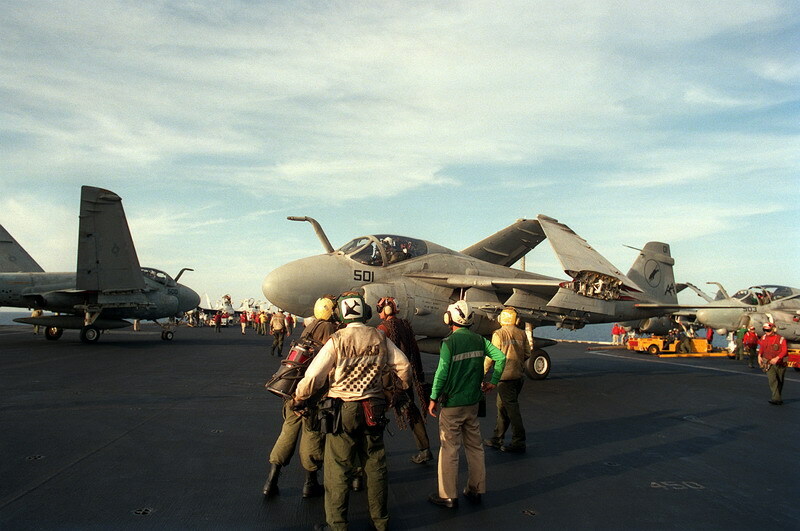 Following participation in those hostilities, VMA(AW)-533 returned home after an “around the world” deployment that lasted eleven and a half months. The first is the aircraft (161689) from VMA(AW)-533 Hawks ED-403 from Operation Desert Storm in 1991. You can see from this picture I was able to find that the A-6E here features a few things talked about in the history on the instructions of this aircraft. See the armoured “blanket” inside the cockpit, the large bomb on the nose with “31” on the nose and “Buck” on the cockpit sides. Even though you cannot quite see the FOD covers in this shot below some for this aircraft are provided on the decal sheet. 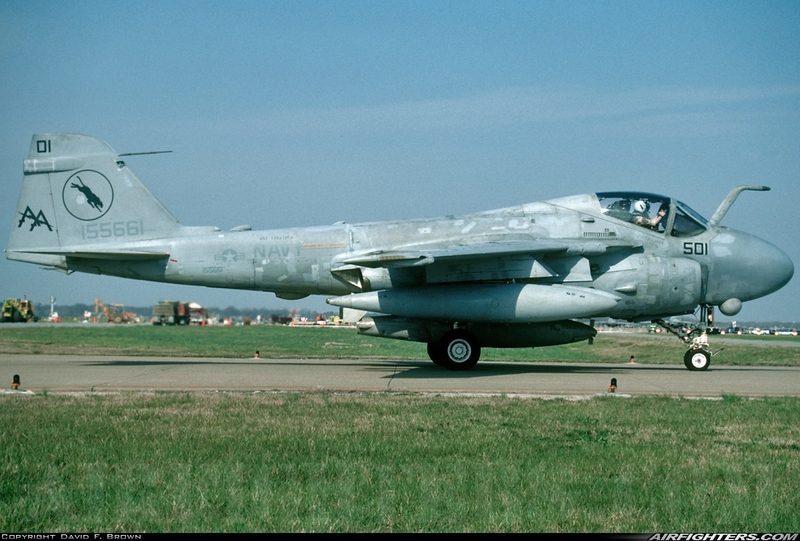 The second is the aircraft (154158) from VMA(AW)-533 Hawks ED-403 from Operation Desert Storm in 1991. 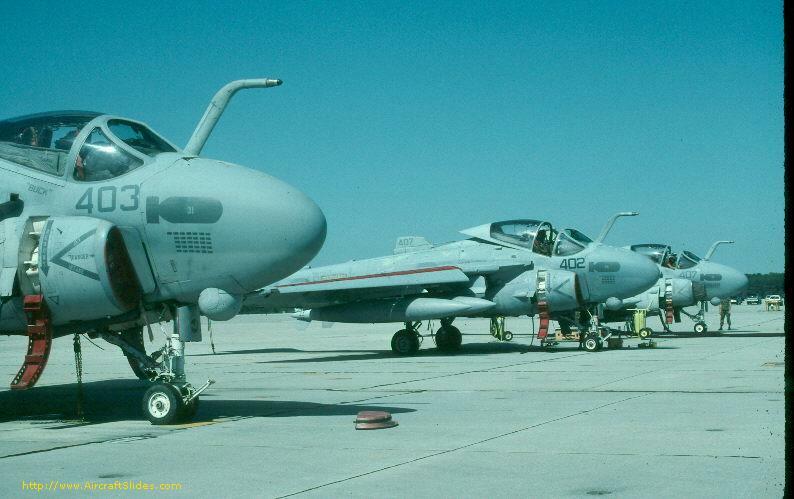 Here is a picture taken of this very aircraft on April 1, in 1991 straight after Operation desert storm so the pictures is pretty relevant to the decals. 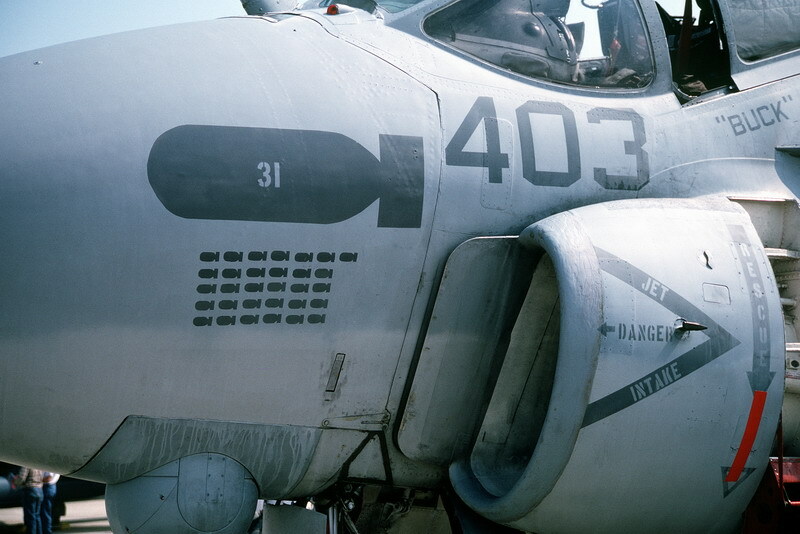 You can see the “Hawg” stencil on the cockpit sides which is provided on the decal sheet and the close spacing on the tail numbers as hinted on in the instructions. One aircraft no# AA-501 (155661) VA-35 Black Panthers in Operation Desert Storm in 1991. A-6E Intruders (VA-35 / CVW-17) embarked on USS Saratoga (CV 60) – 1991 and you can see our A-6E in the centre of this line up. Unfortunately, you cannot see much of this just the nose from this picture. 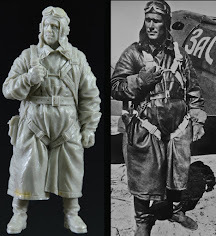 You can however make out the names of the aircrew on the left. Right names are also provided as well in grey or black in case you have better evidence than me. 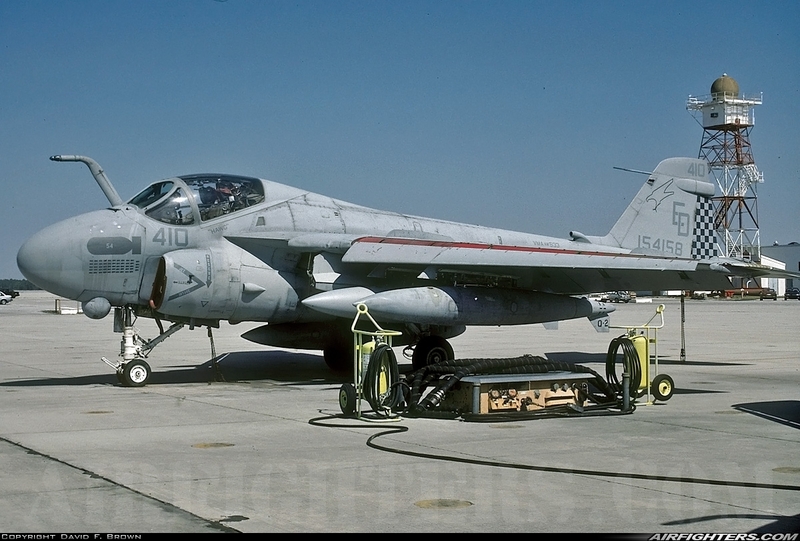 Another aircraft no# AA-505 (152953) VA-35 Black Panthers in Operation Desert Storm in 1991. A-6E Intruder from the VA-35 "Black Panthers", USS Saratoga, tail code "AA”. seen here in side view, you can see here again the research featured on the instructions. 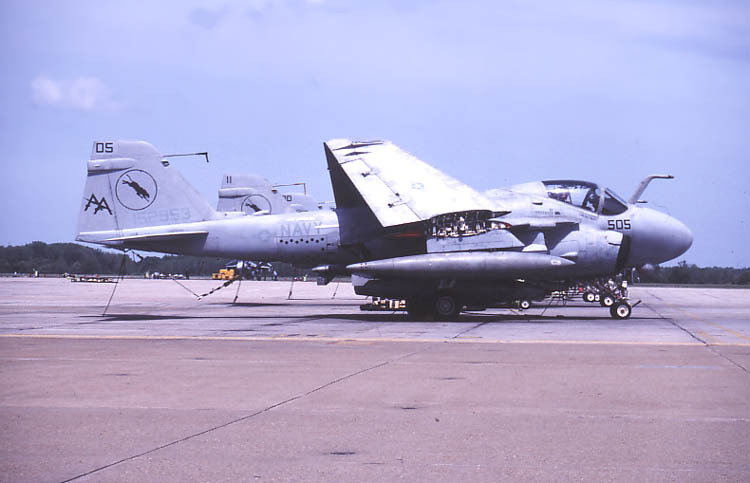 Another picture of this aircraft after the conflict on its homecoming after Desert Storm at NAS Oceana, Virginia – 1991 the tail is good reference of what is already presented on the instruction sheet. There are two decals sheets included here that cover all of the options we have looked at. 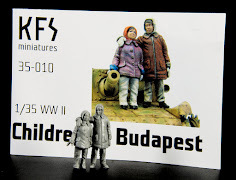 These sheets are printed by Cartograf of Italy which are some of the best contract decal makers around. 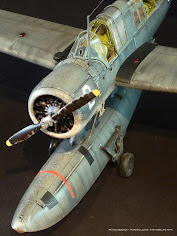 We took a look at how these decals performed with the OV-10A decal sheet when we applied them to a bumpy surface to see how they clung to the aircraft plastic. They performed flawlessly and the finish afterwards without even a sealing coat were good. 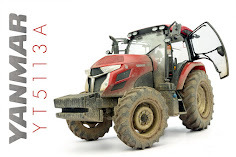 There is a minimal of carrier film but if you want to for safety you can also trim this off with a sharp scalpel blade. It might actually be better in this larger scale. The decals settled tightly to the surface over the raised surfaces and weld detail seams I made sure I put them over. I used some Mirco-Sol/ Set and as you see it is without any top gloss coat - so you can better see how they performed. I like how they snuggled into the crevasses I found for this test. The smaller sheet is also dull of similar details, in fact the only reason there are two sheets of decals I would think sis because they would not fit on the one A4 size of the packet. 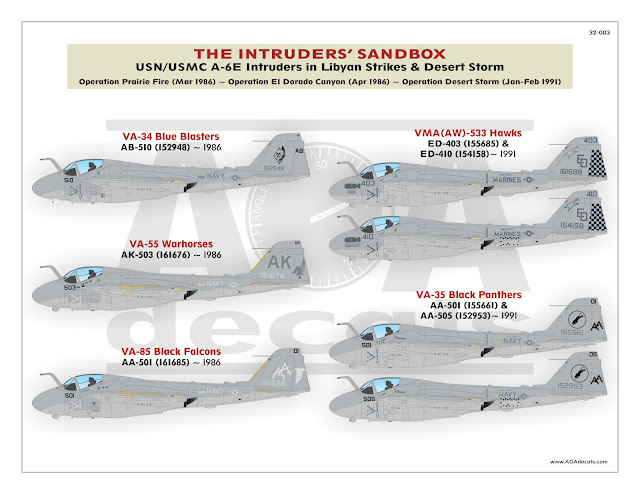 Also included on this decal sheet are the decals also included for crew helmets, fuel tanks, ejection seats, VA-35 MERs, & VA-55 ordnance special markings. Sooo there we have it. The subjects are a good selection of historically important kites, the instructions and limited history on each one is well researched (as we have proved by looking at the real things, and the decals are excellent and perform well. 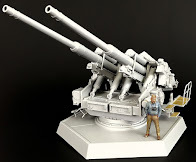 I am surely becoming a big fan of AOA’s offerings and if I had more time to make stuff I would be using them on my own TRAM Intruder. 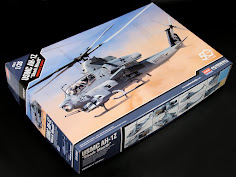 I recommend these for anyone interested in building this kit. It’s well conceived and executed. Well done to AOA.